Join attorneys from Constangy, Brooks & Smith, LLP, who will help you prepare for the newest litigation trends, regulatory interpretations and policy enforcement challenges. Affordable Care Act - Review of recent developments in the ever changing world of Obama Care. EEOC Pregnancy Guidelines - Analysis of the controversial new guidelines issued by the EEOC and how they may impact employers. ADA / FMLA - Advice on ways to avoid the most common traps for employers in an environment of increased government enforcement. Personnel Policies - Identification of policies and practices that should be reviewed and modified as needed based on recent legal changes. 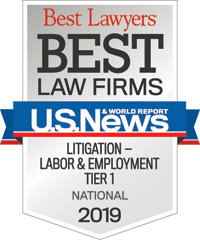 National Labor Relations Act - Review of the NLRB’s newly announced focus on joint employment relationships and how that change may affect employee staffing companies and franchise operations along with employers who use leased employees and persons provided by staffing companies. Union Organizing Update - Summary of recent union initiatives aimed at expanding union membership through the use of innovative organizing tactics. Wage & Hour Update - Litigation and enforcement trends involving the Fair Labor Standards Act, including the increased use of collective actions and efforts to expand the types of employees covered by the Act. Recent Development - A review of the hot topics in the area of employee / employer relationships and the rules, regulations and laws that affect that relationship. Social Media - Developments in social media that affect the work place. Fair Credit Reporting Act - An analysis of what employers must do to win Fair Credit Reporting Act claims. Workers’ Compensation - A review of when and how an employee who has filed a workers’ compensation claim may be terminated. A block of rooms has been reserved at the Sandestin Golf and Beach Resort. To reserve a room, please call 800.320.8115. **PLEASE USE GROUP CODE 2363YJ WHEN MAKING YOUR RESERVATION. This code is good for 3 days prior/3 days following conference dates. For information regarding this event please contact Kristi Koroknay at 205.226.5479 or kkoroknay@constangy.com. **This program is pending approval for HRCI Credit Hours.